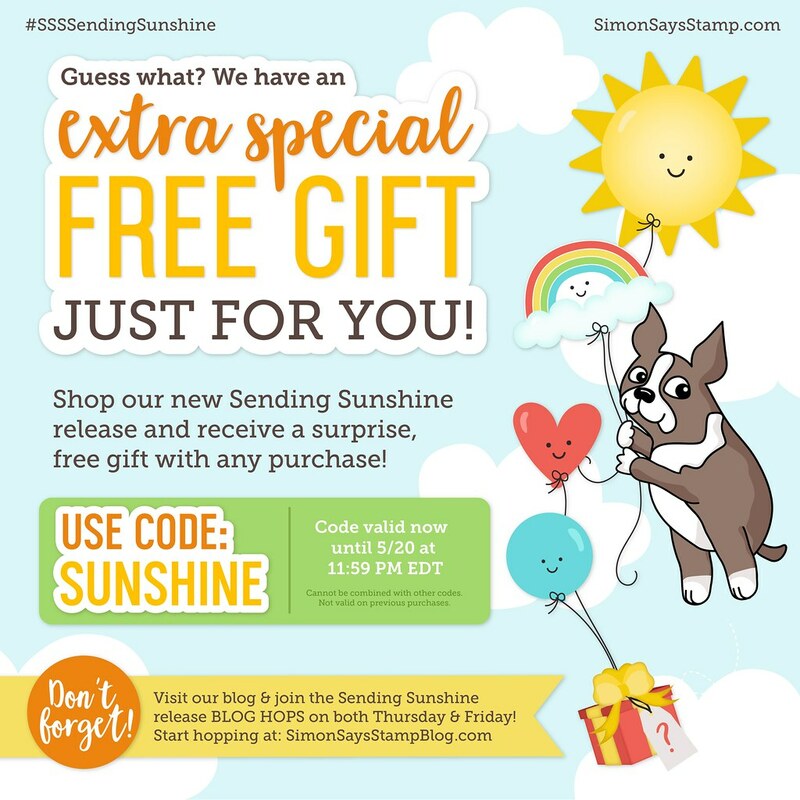 Simon Says Stamp Sending Sunshine Blog Hop! 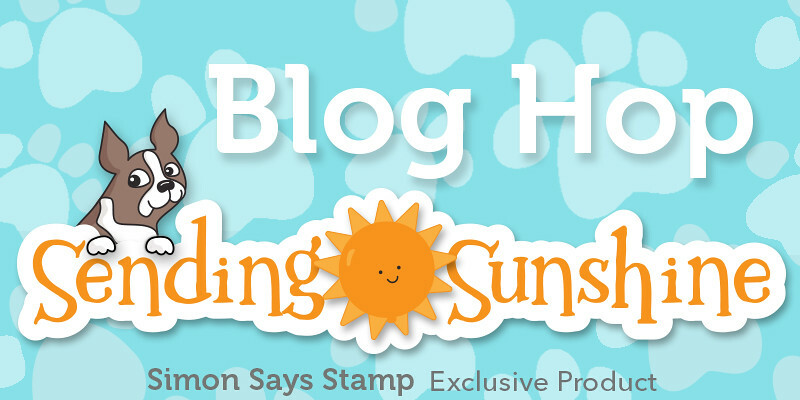 Today I am excited to be participating in Simon Says Stamp Sending Sunshine Release Blog Hop! The release was yesterday. So all the new products I am showcasing today are available for purchase at Simon Says Stamp store. Your are on the last stop in the blog hop. If you are hopping then you should have come from talented Anna-Karin Evaldsson‘s blog. If not, don’t worry I will provide you with the list of all the designers in the blog hop towards the end of the post. Sending Sunshine release is gorgeous. So much fun summery products to play with colours. I love it all. For my project, I have used Deco Diamond background stamp with Flower Cluster die and Four Seasons Saying stamp set. I love combining patterns. So here, I combined a deco pattern with floral pattern with lots of colour and contrast. I stamped and white heat embossed the Deco Diamond on Neenah Solar White panel. Then sponged distress inks in rainbow colours for an emboss resist technique. I trimmed this panel to 4″x5.25″ in size. Then I die cut Flower Cluster die three times using black glitter paper from Simon. I arranged and glued the die cuts on top of the panel. I love the high contrast of the black glitter against the rainbow resist background. I trimmed off the over hangs. Then I adhered this panel on white card base using foam adhesives. The sentiment from Four Seasons Sayings stamp set is white heat embossed on black cardstock, trimmed and adhered using foam adhesives. Finally some black sequins to tie in all the black together. Love love how the two patterns go well with each other. What I really love to do with the Deco Diamond background stamp is to gold heat emboss on black cardstock. That will bring out the true art deco out of the stamp set. I will share that project in another post. All the supplies used to make this card are listed below. Now coming to details of the blog hop. There is a special promotion today! Woohoo! There is an extra special gift with you purchase between now until 20th of May 11.59pm ET. Here the code word for it: SUNSHINE. More details below. Then there is a $25 gift coupon at every stop along the blog hop. So make sure you leave a comment on every stop in this blog hop. Winner will be chosen over the weekend and posted on Simon’s Blog on Wednesday. Awesome giveaways as always! As promised here are the list of participant of the blog hop. Thanks always for stopping by my blog. beautiful work! that black glitter cardstock is one of my favs! Gorgeous card Gayatri! I love the colourful background with the contrast of that super pretty black floral die cut. Thanks for sharing this inspiration using the awesome new release! That’s really lovely, the black glitter paper looks great against the rainbow background! Beautiful card, I love the rainbow color background with the black delicate floral die cut! Love the card with the combination of die cuts on the embossed background stamp. Very stunning. Great card. That black really stands out! First off thanks for sharing about the free gift! Yeah! And 2nd WOW! Those bright colours with the black! It is stunning! Such a great release by SSS, and at least for myself I generally only buy items after I have seen such an awesome card as above and want to recreate it somehow. So thanks for the links below! I love this! Those are my two favorite things from this release and I love how they look together. The glittery black flowers together with that gorgeous rainbow of color is perfection. Another beautiful example using the flower cluster ! Absolutely beautiful cards. Thank you for sharing. i am obsessed with that background stamp! Striking card! Love the black glitter die cut against the colorful background stamp. Great color selection, and I love how the black die makes the colors pop even more. This is such a gorgeous card!!! I love that black glitter on the rainbow! Absolutely Awesomeness! Love all the colors and then that striking black! TFS! I LOVE this! It feels VERY summery! Great color and lots of fun too! Gorgeous card and I love the background stamp and your beautiful ink blending. It is perfect with the black die cut. Beautiful job! So pretty! Love your use of the black cardstock for the diecut! Beautiful combination of techniques and colors. Very striking. Very pretty card. Love the colorful background! I love that Floral Cluster die in black. That’s one of my favorites from this wonderful Simon release. Beautiful cards. That card is gorgeous! Just love the way you did it. Makes me really want that background stamp and the die you used as well! Beautiful card! So many fantastic things in this release. OMG…love the rainbow & black glitter cardstock! Beautiful card! Wow, using the geometric stamp and the beautiful flower die together is so effective. I always love rainbow inking. I love that you added the diecuts in black. I’m loving the floral die more and more. Awesome card! Fabulous use of the floral die! Never in a million years would I have thought of using black glitter paper for this die. That’s why I love these blog hops!! Gorgeous rainbow inked background!! Love the floral die cuts!! I really love your card! The beautiful background with the black flowers that pop off. Stunning! I love the combination you made! Color and drama! Good job! 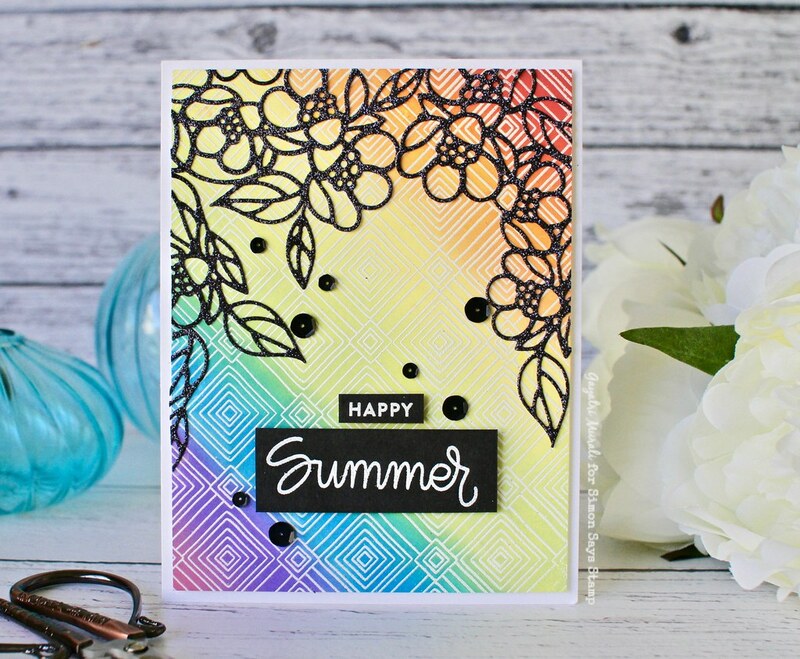 WOW Gayatri, the black glittered die cut is stunning against the rainbow coloured background and the design in this background stamp just adds to its beauty. I love this, well done! The combination of that background with the black floral die cut looks amazing together! Love how it looks and what an amazing release and DT inspiration! I really like the summery background you created, this card is going to make someone very happy! Thank you for sharing your talent. Love this card and I love how you used the die cut pieces – I’ve been wanting this die and now I see how to use it – I love it. Just wonderful! i love the rainbow colors!! The rainbow background makes me so happy! I love the black glitter flowers at the top, it feels like a canopy of flowers on a bright, sunny, summer day. Beautiful cards. I love the background stamp. Great looking card. Love how you combined the two patterns! Great card. The black really pops against that pretty background. Well done. Beautiful card! Love the solar burst stencil and the Bohemian Lace stamp in this release. Your card is so beautifully done, I love it! That is one seriously striking card; I love it! Wonderful card, love how the black adds elegance to the design. How very pretty! Great work. I love the sparkly black on top of the bright colors. Terrific to combine the geometric pattern with the floral die cut. Looks lovely! So stunning! The black die cut floral over the rainbow back ground is beautiful! Pretty and lovely, sunshiny cards! Your cards are beautiful. Ohh the diecuts in black look really cool against the rainbow background. Wow! Love this black die cut over the beautiful background. This is stunning! I love this card! The color and dimension are fantastic! The black glitter paper makes it look so dramatic! Like how striking this looks using black. My favorite die of the release is the flower cluster. So pretty. I have always loved using bright color with a pop of black!! And you just nailed it perfectly!! Love this card! Love the contrast!! The use of the black glitter card is so great! Very elegant combination – so pretty. Wowza! A beautiful combination that I never would have come up with! Thanks for the inspiration. Your use of black makes the colors really pop! Great card. I love that black glitter die cut. A perfect accent. So very lovely! This is a beautiful stencil & your card showcases it so well. I really like that die as well & the black was a good choice. I love the combining of the two patterns. This is just beautiful. That background stamp just blows me away. Oh my goodness. I love this card! I love the black silhouette against the bright background. Very striking! This is a must-have die! Beautiful card! Wow, what don’t I love about this card! The black looks so striking against the gorgeous rainbow colors. The contrast of the graphic organic floral spray against the geometric background. And, of course glitter paper and sequins. Just Fabulous! The black die cut really pops on the colourful background. So, so pretty. The black against that beautiful ink blending is just gorgeous and so impactful. Beautiful card! Can’t wait to see your golden embossing! Beautiful card nice color combo. Such a great card with an amazing background! Gorgeous! The Deco Diamond background is amazing! I love that you used the black glitter cardstock for the floral clusters. It’s stunning on the rainbow background! Your card is beautiful and I love that die cut in black. Such a beautiful card as always you used the must haves products from this awesome release and made them shine. Thanks for sharing and the chance to win. Love the rainbow background teamed up with the black die cut. Wow, the black die cuts on that background make it pop so vibrant. I love it. Thank you for the inspiration and for sharing. Love the flower cluster over the deco diamond BG. Very cool card! Love the dies – always one more thing we “need” to complete our creativity! Beautiful card, Gayatri! Love how you combined art deco and colorful with florals with black!!! Quite unusual and yet very pretty!! So beautiful, loved the black die cut, it really stands out. Beautiful. Your card is beautiful and I love the background!!! Gorgeous rainbow background! Your card is beautiful! That background on your card is incredibly beautiful! Love it. I always love rainbow colors with black accents. Those floral clusters…oh my! I love! Your card is so beautiful.. great job! I love so many things from this release.. i want them all! Love the colors in the background. 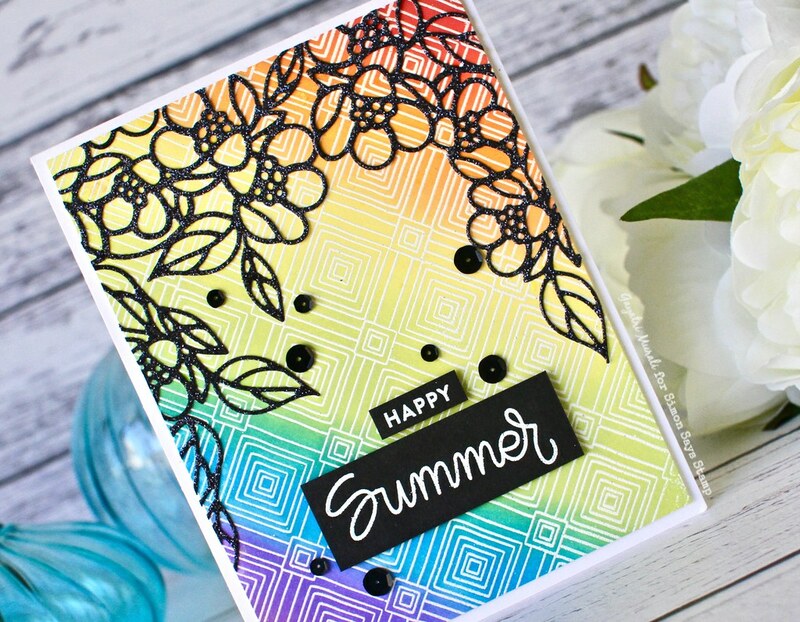 Fun and fabulous card with all that rainbow color peeking through the black floral die! Love this! Your background is fantastic. I also love the striking black glitter cutouts on top. Beautiful! Very beautiful! The intricate black die cuts are perfect on that colorful background! I would not have thought to combine the deco diamonds with the flower cluster but I love the look. The black glitter die cuts against those rainbow colors is stunning. Thanks for the inspiration! What a beautiful and creative card. Love the great background with the dark flowers. what a great idea. i can’t wait to get my hands on my supplies. yay!!! Great way to use background die cut, love the black glitter paper. Stunning! Beautiful colours and style. Your card is beautiful ! I love the contrast between the happy colors of the background and the dark die cuts. I’m just loving this card…the beautiful rainbow colors on the deco diamond and the flower cluster die in black. Such a great combination. I think these are the two new products I’m going to order first. SSS Sunshine release is another winner! Loving that Deco Diamond stamp. This has to be my favorite stand alone stamp from this release. I love this card. The black just makes it pop. The rainbow colors are awesome as well. Love that flower cluster! Thanks for sharing your art! Oooooo….. I love that you combined the Deco Diamonds and the Flower Cluster die in one card. They are among my favorite offerings in this release and I’m pretty sure I would never have thought of using them together. But now I see that they are lovely together!! TFS your talent and inspiration. Wonderful combination of stamp and die cut! This card is stunning. I love it a lot. Makes me want to for sure get that die cut. Beautiful card! I love the rainbow and black color combo! I LOVE the combo of the rainbow backgrounds and pop of black sentiments! GREAT JOB! The black with brights looks so fresh. It is a nice alternative to pastel tones we usually see with floral cards. Love the look. I love that diamond background and what great rainbows everyone is coming up with. The black die cut is striking on it as well. I love the combination of geometric with floral. So striking!! Nice card. I love the new die. WOW…your card is so beautiful! That flower cluster die cut from black glitter paper really pops off that beautifully inked background stamp. You have definitely inspired me with your amazing creativity! Great card with the die cut on top of your color. Gorgeous card. I love the graphic look of the glittery black die cut flowers of the colour – stunning! The black against that background is beautiful! Oh, WoW! I love the flower cluster over the deco diamonds in those lovely colors! Great idea using black instead of white! So much more pizzazz! Such a colorful and lovely card! I love blog hops because they inspire me to create–thank you! Beautiful card! I love the black die cut against the rainbow background, absolutely stunning! Love the black on the color and the juxtaposition of lacy over graphic! So pretty. Love the background and the flowers on the top. Wow what a color contrast! I love the background stamp and the way you applied color to it! Love that flower cluster die cut with glitter paper! So much inspiration on this hop! Very nice card and thanks for sharing. Wow!!! This is sooooo Beautiful!!!! Love the floral canopy over the colorful Deco Diamond background. Thanks for the inspiration! The black die on the rainbow paper looks wonderful! Love the bold colors with the black! Stunning card!! Love the black on that colorful card. Beautiful creation. Thanks for sharing. Nice card, unusual color combo. So beautiful. I can’t wait to get that background stamp. I love the colours you chose with the pop of black overtop. 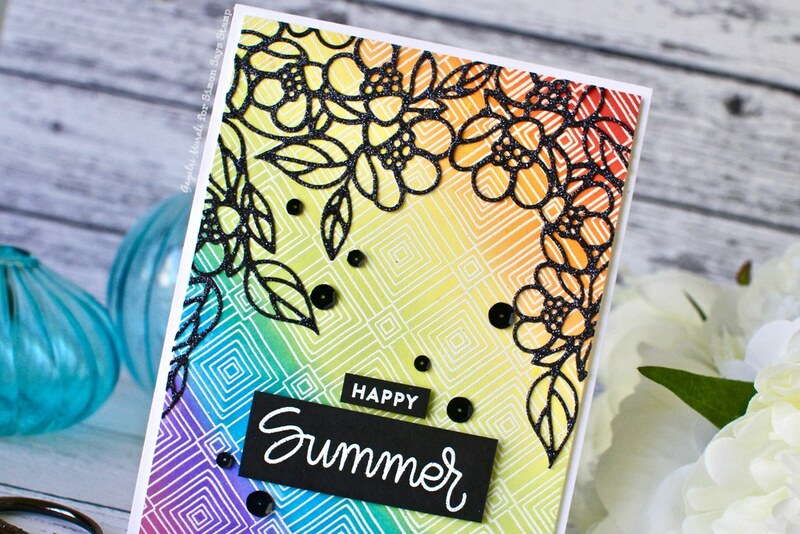 What a great idea to use the black glitter cardstock on top of the rainbow background! I love how this turned out, especially because you’ve used some of the more popular products in the bloghop, but you’ve created an entirely different look with them. Thanks for sharing! would have never thought to pair these two products in the same card. Love it! This background stamp is one of my favorite things from the release. I really like how you paired the rainbow background with the black glitter die cuts. Just beautiful! Oh yes I agree these two patterns are epic together! The geometric lines in the background contrasting with the curves of the die cut floral….epic. Great job. Thanks for sharing! I love the black accents on this cool and colorful geometric background! Love that Deco Diamond design! Love the black over rainbow! So vibrant! 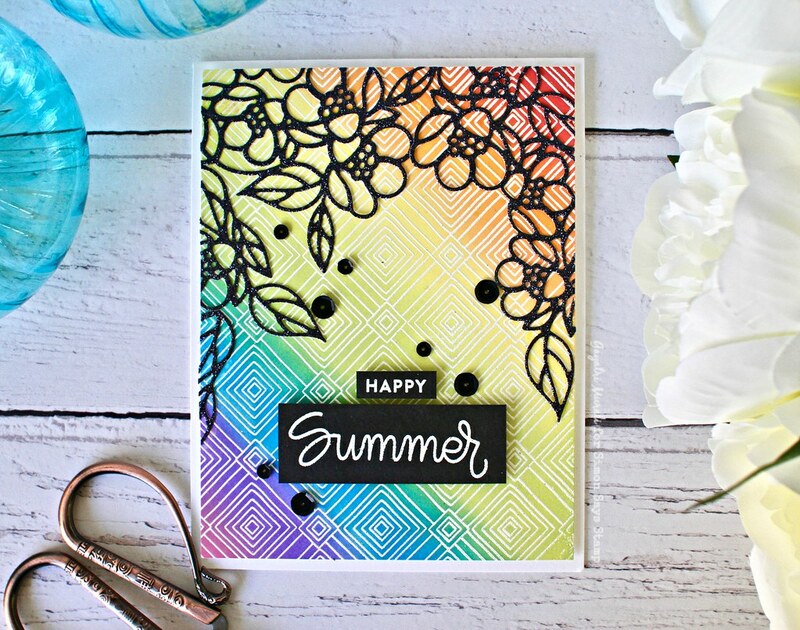 Love this stamp and stencil, and the colors you used are sooo pretty together. This combination of dies and background is so striking! Love!!! You love combining patterns and you do it so perfectly !! Lovely card! Beautiful design and colours, thanks for the inspiration!